Having processes that are repetitive, manual tasks – like loading and unloading product – can lead to high employee turnover and quality issues. Repetitive tasks are ideal targets for automation, but you may have limited manufacturing space and limited budgets for new automation equipment. Many food manufacturing organizations also have high-mix, low-volume production, or are dealing with seasonal production surges and lulls, which isn’t cost-effective for traditional automation, especially if you’re not a robotics programmer. Even if you can automate some of those tasks, there’s still the issue of maintaining a safe working environment for your employees. For most manufacturers, one of the first tasks that they think of automating is packaging products. And that makes perfect sense. But when companies start automating, they start seeing more and more processes that they can optimize. With its soup-to-nuts automation capabilities – quality control, packaging, labeling and palletizing – companies using UR cobots have tremendous options to automate throughout their entire manufacturing environment, making it an easier, more cost-effective cost center. 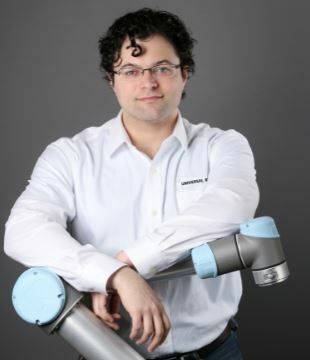 Cobots are ideally suited to meet the challenges companies are facing, and are flexible enough to be deployed throughout an operation. For those who aren’t familiar with cobots, here’s a quick comparison of traditional industrial robots vs. cobots: unlike traditional robots, cobots are small and flexible, the set up is fast, they’re easy to use, they’re safe alongside workers, and the upfront costs are low, with a quick ROI. 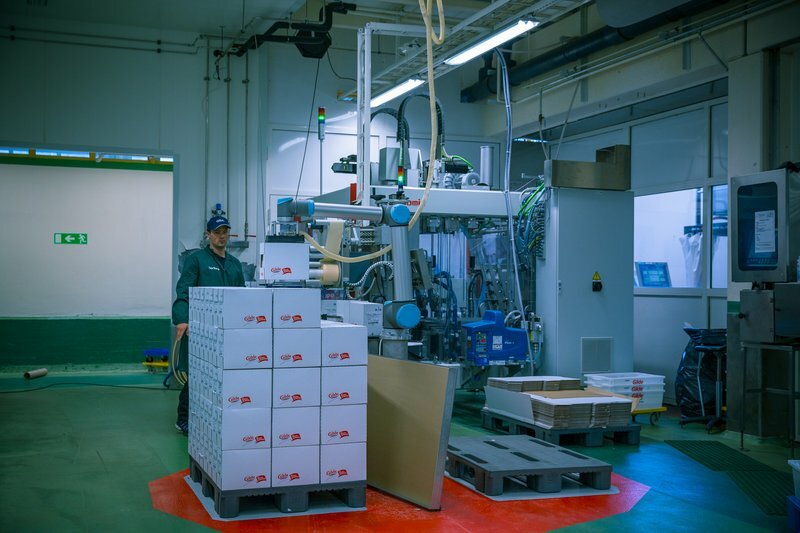 One company that has benefitted from its installation of cobots is Atria Scandinavia, one of Northern Europe’s leading manufacturers of vegetarian and gourmet foods for the convenience market. Traditional automation systems cause hours-long downtime and require outside support. 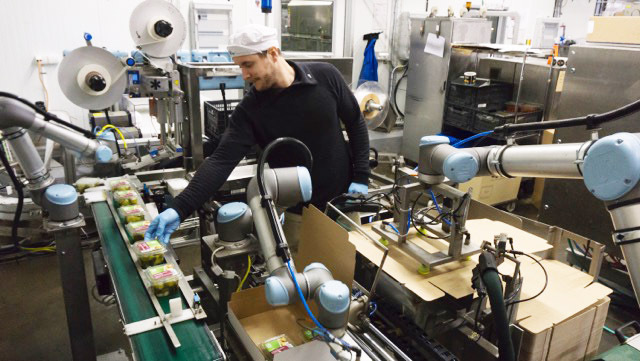 Atria Scandinavia installed three UR5 cobots initially – for labeling, packaging, carton folding, and palletizing. They needed automation that could be programmed by current employees with no prior experience and could be supported in-house to minimize downtime. Automating three production lines, each packaging 228 items per hour. A solution that could work side-by-side with employees with no safety guarding required. No prior experience required to work with robotics. Now that they’ve automated, Atria is never going back. In fact, they’ve laid out several plans to replace their traditional, shielded packaging machines with cobots. And, now that they’ve completed the first cobot installations, the next ones will be even faster – likely just a couple of weeks. 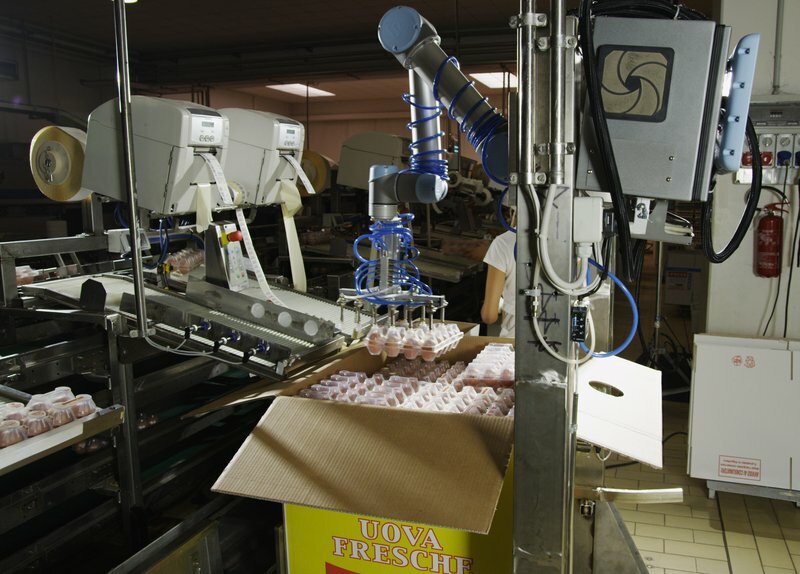 In Italy, at Cascina Italia, S.p.A, a UR5 cobot equipped with a pneumatic gripper gently picks and places trays of eggs to load corrugated cases with up to nine layers. In addition to eliminating manual loading, the egg supplier has registered an increase in capacity from 150 boxes per hour to 300 boxes per hour. The capacity boost is quadrupled since Cascina has four filling lines each equipped with a UR5 operating at about 10 cycles per minutes. Three flexible lines handle boxes holding 96, 144, or 192 eggs. The fourth line is dedicated to a bigger box holding about 1,400 eggs. Another food manufacturer now deploying cobots is Nortura, an agricultural coop owned by 31,000 farmers in Norway that produces nearly half a million pounds of processed and cured meats every year. The company needed a continuous palletizing system that could run with minimal supervision but needed to be able to use the space for other processes if there wasn’t a pallet in place. They mounted the robot on a narrow stand that takes up only half a square meter. When there’s not a pallet in place, the space is completely free. Once a pallet is placed on the floor, the vision system on the ceiling automatically detects it and the robot begins palletizing on its own. Daniel is a Technical Service Engineer focused on Technical Instruction, pre-sales support, and application troubleshooting. He’s spent nine years in automation, with a focus on robotic laser welding and cutting, and has a degree in Electrical Engineering from Washington University in St. Louis. Daniel works out of Universal Robots' Americas Headquarters in Ann Arbor, MI, covering the Great Lakes region.